Catapult Services are in Chorleywood offering a professional range of First Aid training in Hertfordshire for families and local businesses. Catapult Services are STA (Safety Training Awards) qualified and approved, they are fully insured and are a Qualsafe Awards Registered training Centre. Their First Aid training is popular with schools, sports clubs, small businesses and education providers. 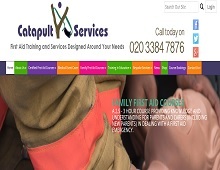 If you are looking for family First Aid courses in Rickmansworth, Paediatric First Aid training in Watford or Emergency First Aid at Work in Chorleywood, then contact Catapult Services for professional first aid training throughout Hertfordshire.